We’re really excited to announce that you are now able to order Customised garments online direct via the website. 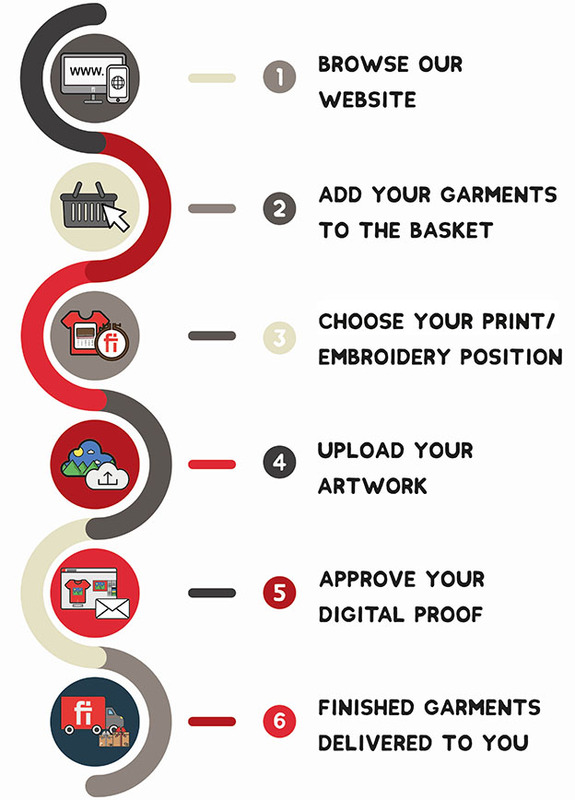 Here at Fire Label we have been busy behind the scenes creating an online ordering tool so that you can now place orders for custom garments online 24 hours a day, 7 days a week. Once you’ve completed the above we will then do the rest for you including producing the visual proofs for you to approve. We only begin producing your order when you are happy with the visual proof and give us your full approval. Embroidery: 100mm wide / Maximum 12k stitches. Screen Printing: Maximum of 2 colours. We are able to embroider bigger designs and print up to 9 colour screen prints but these will need to be processed manually by one of our Account Managers. So, if your design is more complex or has a larger amount of colours please get in touch and we will be pleased to help you. All artwork will be checked for suitability. If unable to use the artwork we will be in touch. If artwork is more than 2 colours or 12k stitches we will be in touch (new quote will apply). If all OK we will produce a visual proof for you to approve. Design will be the same size/colour & position on each style and all sizes of garment. Production begins when you are 100% happy with the digital proof. Delivery time 10 working days from proof approval.